The economic growth of China in 2014 dropped to its lowest level since 1990 with the country just failing to reach the official annual growth target of 7.5 percent for the first time in 16 years. China's GDP growth at the end of 2014 was 7.4 percent, the country’s worst performance since the 3.8 percent growth in 1990, the year after the suppression of pro-democracy demonstrations in Beijing's Tiananmen Square followed by Western sanctions. The country’s GDP reached $10.4 trillion (63.646 trillion yuan) and is the lowest since 1998, the National Bureau of Statistics reported Tuesday. Although China didn’t manage to achieve the performance target fixed by the government for 2014, the annual growth figures still outran the market expectations of about 7.2 percent, according to Reuters. 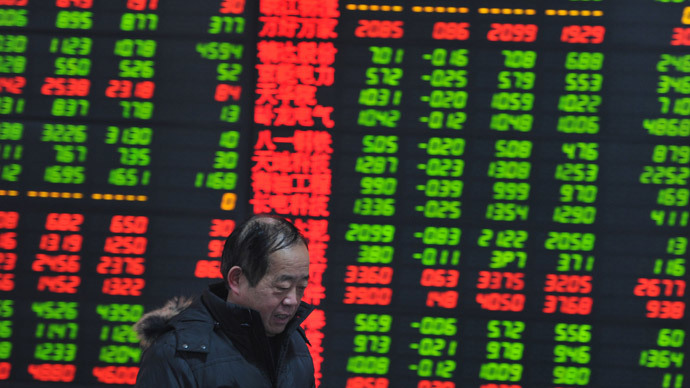 Chinese stock markets rose on the news, following Monday’s fall of 7.7 percent, its biggest loss in more than six years. At the same time, the authorities are optimistic about the development of China's economy. The government says this level is enough to find jobs for the country’s enormous population. "The economy maintains a steady growth in the ‘new normal’, with a positive trend of stable growth, structural optimization, the improvement of the quality of growth and social well-being", said the Bureau’s spokesperson Ma Jiantang. Economists expect the slowdown of 2014 to result in an extended economic downturn. On Monday, the IMF forecast 6.8 percent growth for China in 2015, a number below the 7 percent target economists expect Beijing to set. The slowdown in China comes as the world economy shows vulnerability to regional economic changes. The eurozone risks plunging into a third recession in six years, and Abenomics has proved ineffective as Japan continues to remain in stagnation. China's economic slowdown is also triggered by domestic factors such as a drop in real estate prices, with a property sector accounting for 15 percent of GDP. High total debt is a major drag on the expansion of China’s economy.The country’s overall borrowing is growing faster than the economy, with the debt to GDP ratio exceeding 250 percent.Falling energy prices, industrial overcapacity and a lack of demand can lead to the potential onset of a deflationary cycle. If these issues aren’t resolved in time, China could find itself in a similar situation to Japan, and this is a reason why Beijing may need to tie more money into the system. However, some experts believe the slowdown that is happening amid global stagnation is a natural thing, as China’s has experienced rapid growth for more than three decades in a row.